Great Gift You can even consider these winter touch screen gloves as a great item for gift for your friend,it will be a adorable and lovely gift for them. Thick&Warm Matrial: Premium Dacron & Fluff Material.And three insulation fabrics winter gloves keep your hands warm enough to protect your hands from cold days. High Sensitivity Touchscreen:The gloves adopted conductive material on the thumb and index finger. You can touch screen of your smartphone or tablet without with no need for taking off gloves in the cold weather. 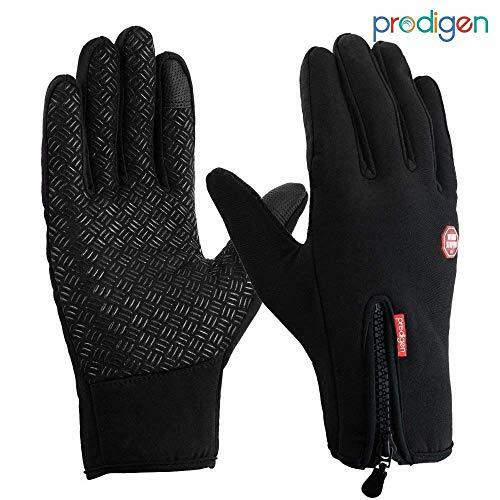 Waterproof&Windproof: It's waterproof and windproof gloves on outdoor sports.This item can waterproof, but it is Slightly waterproof, can not used on underwater or heavy rain days. Adjustable Size&Anti-skid Design:On the back of the golves has a zipper.So you can adjust the sizes to fit your hands comfortably. And the silicone on the gloves palm is to provent you hands skid when you driving or cycling or hold something else. Multipurpose Gloves :The Gloves can be used for cycling,biking,running,motorcycle, driving outdoor sports for men and women. Want to capture every moment of your winter adventure without taking off your gloves? Want to keep your hand comfy and warm in cold weather while still maintain graceful? HiCool Touch Screen gloves will be a great choice for you. These gloves are touch compatible, make it possible to operate your touch screen phone or tablet normally, meanwhile makes you popular while wearing these gloves. 1.The sensitive touch conductive material is applied newest research technology, which will never damage the screen. 2. Applied the anti-skid silica gel design on palm and fingertips, better to hold the item tightly and not easy to fall, making you securely to control the steering wheel and gears when you're driving. 3. 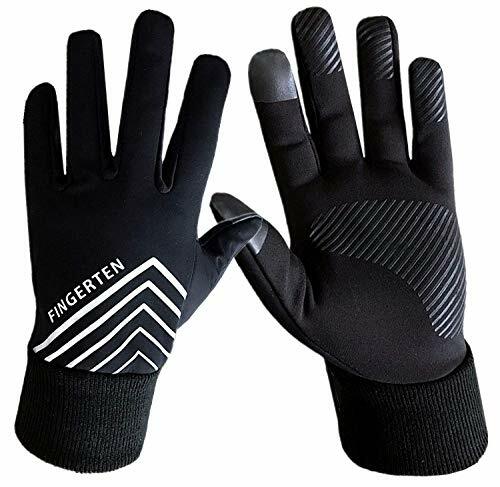 Made of elastic material and tailored great fit design, which fits close the hand well, and flexible enough to bend your fingers freely without stiffness or bulkiness. Adopts delicate and smooth sewing craft, focus on every detail to ensure premium quality and durable performance of the winter thermal gloves, giving you the best use experience. Thumb and forefinger feature high performance touch screen sensors allow for using devices perfectly, such as smartphones, iPads, tablets, touch screen computers, vehicle GPS systems, ATM and much more, without the need to remove winter gloves. 1.Preferred washed by hand or spot clean recommended, do not wash by hot water, do not chlorine bleaching and iron, hang dry in shade. 2.These exercise gloves is not waterproof, please do not use it in some water sports. 3.Please measure your palm width and palm length to choose the suitable size for you. Comfortable and Versatile Made of high-quality elastic wool lycra fabric, windproof, warmer, and more flexible. 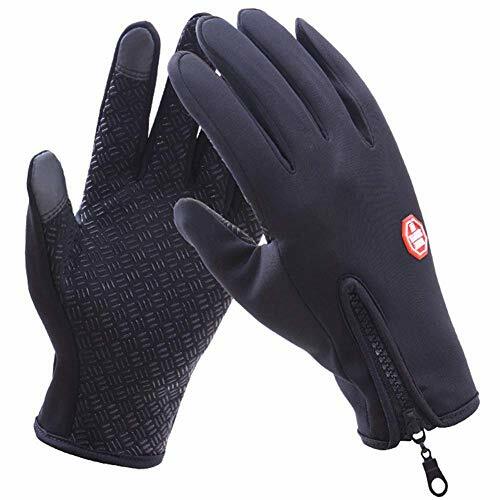 This outdoor sports warm gloves is ideal for driving, running, cycling, walking, hiking, climbing, jogging, photographing , etc. Fingers Touchscreen:Coated with touch conductive material on the thumb and index finger part,enables you to use the smartphone and touchscreen devices efficiently without having to take the gloves off. Versatile Style:Perfect for cold winter casual riding driver hiking running bicycling snow landscaping DIY projects Cross-Country skiing snowmobile and other winter outdoor activities. 2-in-1 VERSATILITY: Keep your hands toasty warm and dry with our convertible 2-in-1 Running Gloves-Mitten! Versatile and comfortable, you can wear these as gloves or mittens. When it's cold on your morning run, pull the windproof mitten cover to keep your hands warm. When it gets warmer, you can tuck the mitten cover back into a built-in pocket on the glove! LIGHTWEIGHT PERFORMANCE: These glove liners provide a lightweight layer of toasty warmth and protection between your hands and the harsh wintry world. They're perfect for running, hiking, biking, driving and warmer days on the slopes! The reflective accents at the back will help you stay visible even in the dark or at night time. You're in good hands. NEW PRODUCT LAUNCH SALE Spread the cheer with our LIMITED-TIME HUGE GLOVES SALE. Take advantage before prices go up! After all, we don't want winter to catch you with your pants down! And with over 5000 5-star reviews on Amazon, our outdoor products are a favorite on Amazon. We put a 1-year no-questions asked warranty on our gloves. I'm (g)loving it. Be tired of taking off your gloves for operating your phone? Irritated by gloves stitching apart or easy-wearing? Then choose our gloves. 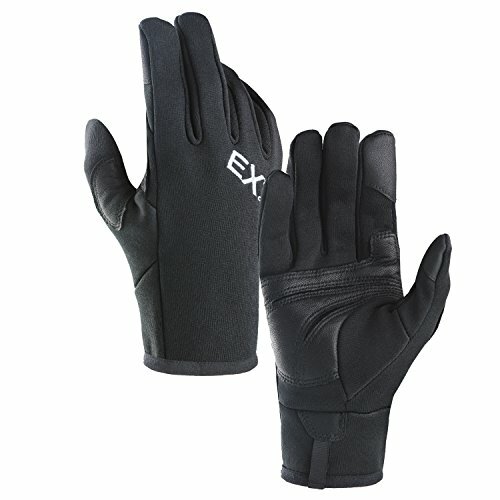 These EXski Gloves are made from 70% high elastic spandex, which ensures the high comfort. Completely fit without a wrinkle like your second skin. Special curved crescent touch screen sensors on the thumb and forefingers maximum increase the sensitivity of operating smart phones and other devices for texting and playing games. Durable wear resistant genuine leather palm ensures comfort, breathability and elasticity, and enhances grip in all activities. Quality cuff trim protect the wrist from being tearing even with strong pull for thousands of times. Unique and exquisite closure is for easy taking on and off. Suitable for driving, traveling, running, cycling, gardening, camping, mountaineering etc. Please measure the circumference of your flat hand under the knuckle exclude the thumb. 1.Best washed by hand. Soak with soap, then rub and wash, dry in the shade or with your hair-dryer. 2.No hot water, No strong acid. No bleach. 3. No exposure in the burning sun, will result in pilling, deformation and limpness. 4.No recommend to wash the gloves often so that it will destroy its warmth function. Sensitive Touch Screen Compatible: Finger tips with particularly soft and wear-resistant conductive leather, can effectively react on touchscreen devices for fast typing and playing games. Superior Grip & Wear-resistant: Cutted genuine leather palm enhances hands grip of alpenstock, handle and steering wheel. Durable and wear resistant to protect hands from injury. Breathable & Snug Fit: Weaved with 95% high elasticity Spandex, provides hands freedom of movement while keeping warm and breathing for climbing and camping in the transitional period. Reinforced Cuff with elastic band is special treated for anti-pulling, the hanging loop on wrist is practical for carrying and fast put on and take off. 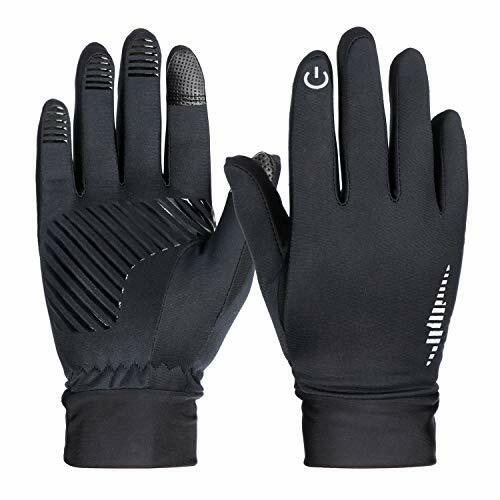 Must-haves for moderately cold weather: These running gloves is perfect for weather from -10 to 15 , ideal for running, hiking, camping, mountaineering, driving etc. During the cold weather months you want running gear that works hard for you. The feature packed TrailHeads Touchscreen Gloves with Reflective Mitten Shell are destined to become your favorite winter gloves for working out. Switch easily from gloves to waterproof mittens and give your hands that extra bit of warmth and protection when you need it. When you don't want it the mitten shell folds away into a convenient pocket so you can set your fingers free. The mitten shell is made from waterproof material to prevent wet and rainy days from getting in the way of your run! The thumb is made from grid fabric so you can wipe the sweat from your brow and stay comfortable during winter workouts. Our running gloves are complete with reflective accents across the mitten shell and reflective piping in the stitching of the cuff. Improve your visibility and make sure you are safe and seen while working out on the roads. These touchscreen gloves are excellent winter accessories. With the entirety of the thumb and forefinger made from conductive fabric, you don't have to worry about annoying seams landing in the wrong place on your finger. Adjust your music, monitor your workout app, take a selfie and text with ease! Normally it's so easy to lose a glove, but not these! Embedded in the fabric of the wrist are magnets that keep the gloves together when you aren't wearing them. Easy care; machine wash cold; air dry. 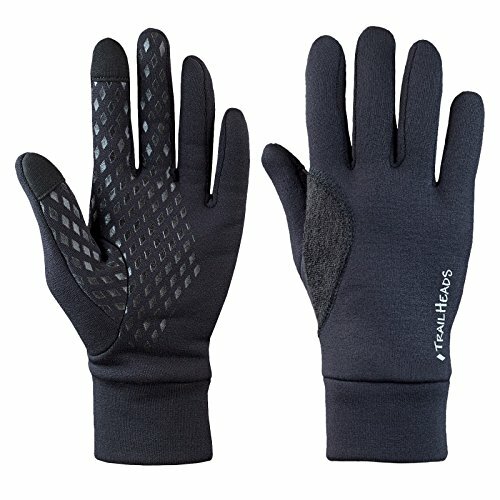 The TrailHeads Men's Convertible Running Gloves are ready to work for you! Wearing these, athletes can get out and stay active all winter long! 2 in 1 VERSATILITY- our cold weather men's running gloves convert into mittens to provide extra protection from the winter elements. The mitten top tucks easily into a pocket on top of the wrist. As winter gloves for athletes our lightweight gloves have a lengthy cuff that fits into a jacket sleeve to lock in warmth. 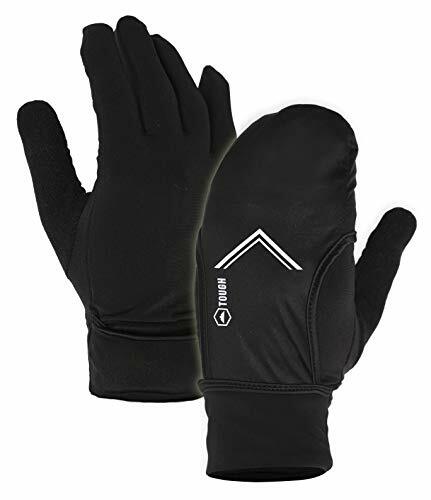 TOUCHSCREEN GLOVES- The full length of the thumb and forefinger are made from conductive fabric. With our touchscreen gloves you have easy access to your phone without irritating seams across your fingertips! BE SAFE BE SEEN- These classic black running gloves are enhanced by reflective piping across the cuff, the mitten cover and a small reflective logo. Reflective accents aid visibility during low light workouts on the road. WATERPROOF SHELL- To keep rain & snow from freezing your fingers the mitten shell is waterproof! The thumb is covered with grid fleece to wipe your brow on. Magnet tabs in the wrists keep our winter running gloves together when you aren't wearing them. TRAIL TESTED GUARANTEE - Your complete satisfaction is our goal. If you're not happy with your purchase, let us know and we'll provide a replacement or refund - no fine print, no time limit. Nothing but our commitment to do what it takes to satisfy our customers. TrailHeads Men's Running Gloves are your ideal cool weather workout gloves. 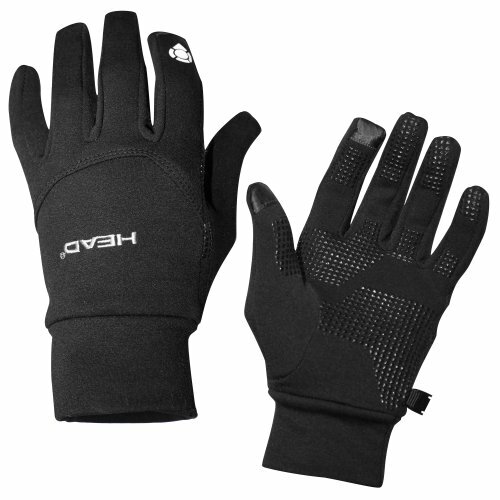 These black running gloves combine a wind resistant exterior with a moisture-wicking inner layer in order to maximize warmth. Made for movement; the Polartec Power Stretch Pro fabric is made of 31% nylon, 52% polyester, and 17% Lycra. Our lightweight gloves move with you for a comfortable fit that never loses its shape. During the fall and winter running seasons they will become your favorite running accessories. 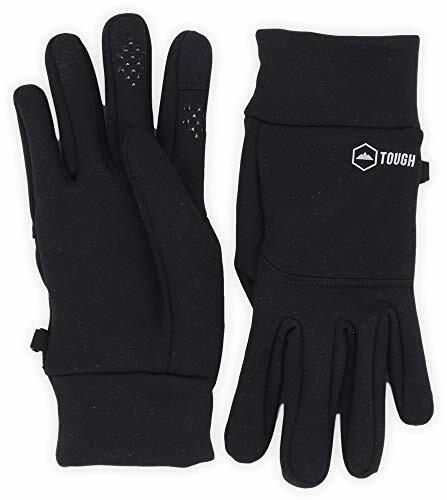 Note: these lightweight gloves are designed as workout gloves for aerobic activity and are not intended for standalone use in extreme cold weather. 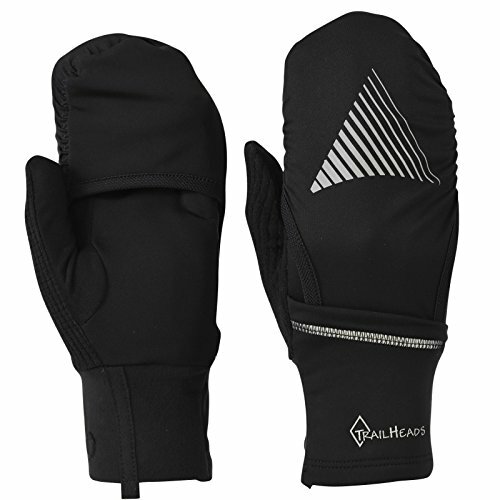 During non-aerobic activities or in conditions of extreme cold (ex: while hunting or skiing) they can serve as excellent glove liners when paired with thicker gloves. Palm grips make it easy to hold your smartphone device while touchscreen technology makes texting simple! 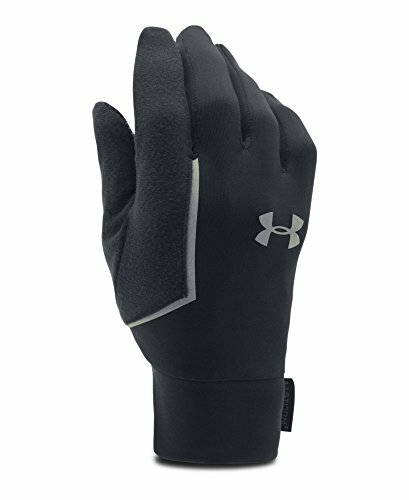 Our men's touchscreen gloves will allow you to adjust your music, monitor workout apps, and take photos; all without having to remove your gloves in the cold weather. This season make the Trailheads Men's Running Gloves your go to exercise accessory! The Head Multi-Sport Gloves feature SensaTEC Touch Screen Compatability. The grip is secure with a Silicon Palm Design. These gloves have a sleek design and style with an extended cuff. These gloves are perfect for the cold weather athletes. Thin, tight-fitting liner gloves can be worn on their own or as a first layer under heavier gloves in harsher conditions. UA Storm finish repels rain & snow without sacrificing breathability. Soft ColdGear EVO fabric delivers an ultra-warm feel, with no extra weight . Material wicks sweat & dries really fast. Tech Touch print on thumbs & fingers allow you to use touch screen devices without taking your gloves off. Tapered wrist cuffs for enhanced protection & a snug, comfortable fit. Reflective logo & details increase visibility . Make your daily commute or recreational activities much safer and more enjoyable. 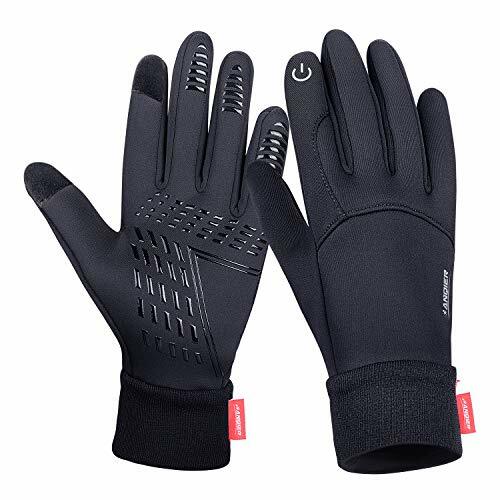 Traditional cycling gloves can not touch smartphone screen, you have to take off glove when calls come in, which is really a undesirable thing in winter. What's more, normal gloves are not waterproof, you can not use it in the rainy day. What makes the Pudolla Cycling Gloves so much better? Pudolla Waterproof Touchscreen Cycling Gloves make your cycling more comfortable. The Pudolla gloves have so many humanized design including smart touch, waterproof, anti-skid etc. Please select the appropriate size according to your palm size. Pudolla sport fittings are passionate at offering the best quality products with reasonable price and the best customer services. All Pudolla products are backed up by our 12 Month Product Warranty that provides peace of mind to our customers. TOUGH-TESTED 1 YEAR WARRANTY: With over 5000 5-star reviews on Amazon, our outdoor products are a favorite on Amazon. We put a 1-year no-questions asked warranty on all our gloves. I'm (g)loving it. HUGE SALE Spread the cheer with our LIMITED-TIME HUGE GLOVES SALE. Take advantage before prices go back up! After all, we don't want winter to catch you with your pants down! 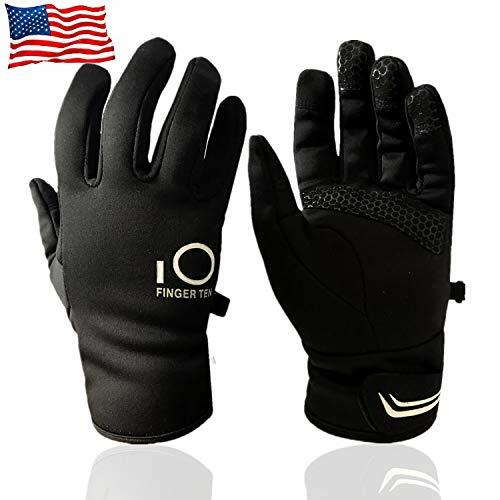 Waterproof&Windproof: It s waterproof and windproof gloves on outdoor sports.This item can waterproof, but it is Slightly waterproof, can not used on underwater or heavy rain days. Multipurpose Gloves:The Gloves can be used for cycling,biking,running,motorcycle, driving outdoor sports for men and women.